t*rexes and tiaras: Sunday Shoes 028: Topshop Juniper + ASOS Poet..
Once I'd discovered what this Black Friday business was all about, I may well have taken advantage of some of the fabulous offers which I'd seen floating about. 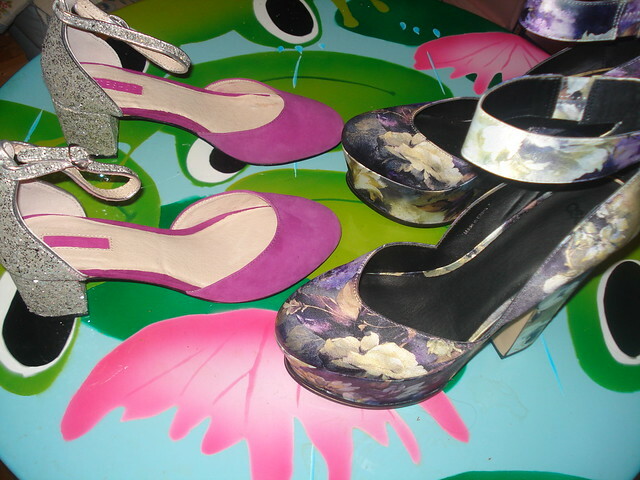 I ordered several new dresses (I'm wondering about a round-up post about them next week) and these two pairs of shoes, neither of which I'd been 100% certain I'd love enough to keep when they arrived. But guess what? I do. Both pairs are staying. These ASOS Poet platforms stole my heart as soon as I saw them. Having been given a 30% off code for the site, I'd been having a casual browse, as you do. Chunky, sturdy heels and a huge platform, yes, but they somehow manage to avoid looking too "Lita", which is good as I can't stand the infamous JCs. 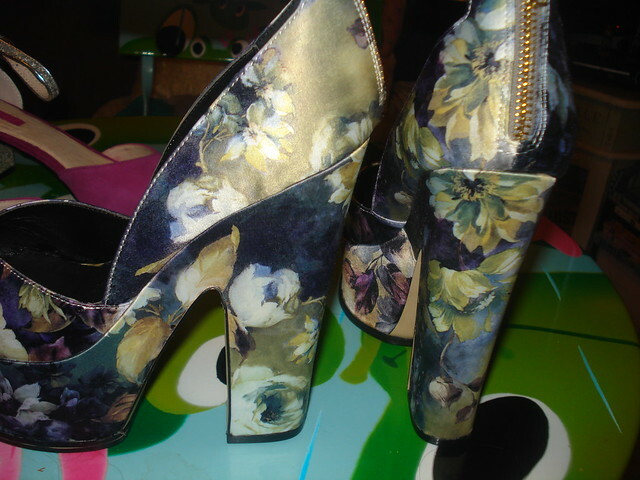 The Poet platforms are finished in a lovely printed satin, and the contrast between the soft floral print and their chunky heel zips actually really appealed to me. In the past I've had problems with similar styles to this which had big ankle straps which were too tight and meant the shoes didn't fit (I seem to recall River Island in particular being bad for this - I know my calves are pretty huge but hey, if someone is a size 7 or 8 in shoes, it's unlikely that they'll have a twig-thin calf, isn't it?!). No such problems with Poet, though. The strap makes it a little tricky to get the shoes on in the first place, sure, as you have to unzip them and then get your whole foot through the zip/strap opening, but once in they are certainly true to size and consistent with my other ASOS shoes. Basically, I love them, and wouldn't have been unimpressed with them if I'd paid full price, but for £35 I think I grabbed a bargain! I'd seen these Topshop Juniper shoes in store in London and walked by. Looking at the sort of shoes I usually wear, you'd be forgiven for thinking they're not my kind of thing, at all. Ordinarily, that would be the case. I mean, they're not my usual height. But, I was flicking through the shoes and accessories in the 20% off promotion which Topshop had running for Black Friday, and I decided I would give them a try, because, umm...glitter! 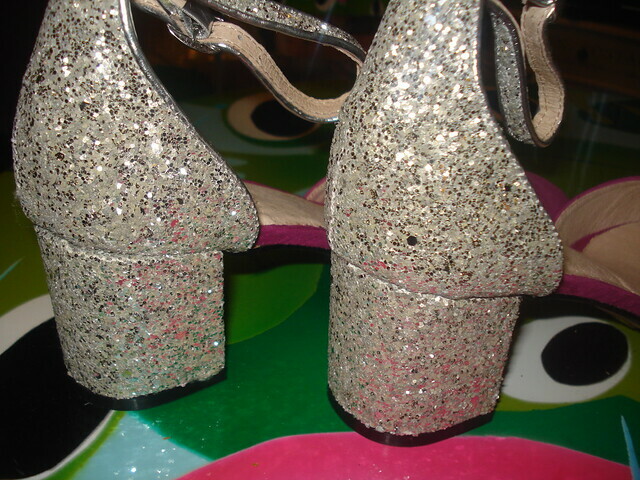 From the front they're fairly simple, but I love the glittery strap and heel section. I'd not been sure whether I liked the pink or the teal best, and now that I've got them and realised how much I like them, I sort of wish I'd ordered both colours. I'm rather glad I stepped out of my comfort zone with these as I'm thinking they'll be great for some of my shorter skirts and dresses, when really high heels aren't quite so appropriate. And, you know...glitter!! I love the Topshop ones, anything with glitter and I'm there! Ah I'd been eyeing up those topshop shoes. Can't go wrong with glitter! Oh I've spied those ASOS ones in the past and thought I'd like them. they look lovely.